—a multi-platform, motion picture and television studio—opened Saturday, May 28 to a crowd of some 10,000 Scientologists and guests in Hollywood, California. The studio is the most modern and sophisticated digital media facilities of its kind on the planet. , Chairman of the Board Religious Technology Center, greeted the more than 10,000 Scientologists gathered to celebrate the opening of Scientology Media Productions—a new state-of-the-art digital media center delivering the message of help, unadulterated and pure, everywhere. with applause when Mr. David Miscavige, Chairman of the Board Religious Technology Center, took the stage to dedicate the Church’s new global media center—Scientology Media Productions. , thousands of Scientologists and their guests witnessed history unfolding with the dedication of the Church’s advanced, fully integrated digital media center designed for the production and broadcasting of programs featuring Scientology technology and Church-sponsored humanitarian initiatives. opens its doors to the world. The facility will revolutionize the Church’s communications footprint throughout the worlds of print, broadcast and Internet media. was unveiled, Saturday, May 28, before an enthusiastic audience of some 10,000, gathered to celebrate the monumental grand opening. 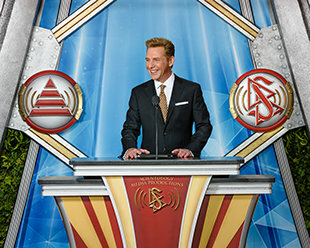 Mr. David Miscavige led the stunning dedication ceremony for Scientology Media Productions. Century studio unparalleled in its power and capability. The ribbon-cutting touched off joyous celebration amongst the thousands present. celebration launched with a high-powered performance of “Wake Up the World”—a song written and scored for the occasion. , Chairman of the Board Religious Technology Center and ecclesiastical leader of the Scientology religion, with (left to right): Mr. Leron Gubler, President of the Hollywood Chamber of Commerce; Mr. Kevin James, Director of the Los Angeles City Film and TV Office; Captain Arturo Sandoval over the Northeast Division, Los Angeles Police Department; and Ms. Linda Dishman, President of the Los Angeles Conservancy. The doors opened wide and the ecstatic crowd surged forward to discover every inch of the Church’s global media center. —the perfect combination of vintage Hollywood and 21st century technology. played host to some 10,000 Scientologists on hand to witness the Church open its studio doors and thereby enter a Golden Age of Communication. the studio’s promenade taking in its marquee billboards commemorating L. Ron Hubbard’s career as a Hollywood screenwriter. soaked up every technological aspect of Scientology Media Productions. —a five-acre complex on Sunset Boulevard in Hollywood, California. Originally built in 1912, the studio includes sound stages, creative suites, visual effects production areas, editing, animation, audio recording and mixing, foreign language translation and dubbing—every aspect of film, broadcasting and online production—and all of it unparalleled anywhere. —where the Golden Age of Hollywood’s past merges with the most advanced state-of-the-art technology of today to help build a better world for tomorrow. The historic five-acre motion picture and television studio has been transformed into a fully integrated digital media production center. to Scientology Media Productions—from industry professionals to representatives of community-minded organizations and groups collaborating on humanitarian programming. Originally constructed in 1912, the studio birthed and nurtured the fledgling motion picture industry. The Church of Scientology meticulously restored this treasured piece of Hollywood history, including the historic Guard House and entrance, which stand exactly as they did during the Golden Age of Hollywood. Every iconic detail of this cultural landmark has been faithfully returned to its original glory. Veteran masons and artisans painstakingly re-mortared the studio’s characteristic brickwork, preserved decorative moldings, columns and red brick flooring and returned all original lighting fixtures, steel casement windows and solid brass hardware to pristine condition. Because of his wide acclaim as an author, in 1937 L. Ron Hubbard received his invitation to Hollywood from this very studio, from the address on this very door. It was here he launched his legendary screenwriting career.
. In this office, beyond the threshold L. Ron Hubbard crossed, now stands an exhibition devoted to his prodigious output during the Golden Age of both popular fiction and motion pictures. reflects the intersection of L. Ron Hubbard history and the studio’s history. On its walls are the marquee billboards from films and serials that Mr. Hubbard scripted for Hollywood. at Scientology Media Productions are capable of producing multiple television programs at the same time—whether it be live news broadcasts or pre-recorded programs featuring aspects of Scientology technology, or Church-sponsored humanitarian initiatives. This wide range of programming is the anchor content for the Church’s 24/7 television network. The original sound stages have been rebuilt to the highest technical and acoustical standards. The stages are custom designed with full lighting fly systems and computerized controls, allowing for flexible and automated lighting for any type of film and television production. Each stage is further equipped with the latest high-definition technology and even robotically controlled cameras. designs elements for everything from live events to broadcast documentaries. Housed in what was the studio’s first shooting stage, the Scenery Shop is equipped with the latest high-tech machinery for building 3D sets and scenery. Directly adjacent to the studios are offices and facilities for every craft and production department necessary for the highest quality broadcast production. This includes a professional hair and makeup department. Among the Historic Corridors of the studio stands a row of five-star dressing rooms. is perhaps the “gem” of the lot, with its Roman Tuscan columns, hand-crafted moldings and Art Deco furnishings. Originally constructed as the studio’s screening room, it now serves as the green room for those participating in programs produced here, from talk shows to telethons. of the Little Theater—hidden behind false walls for decades—have been restored and returned to their original beauty. The studio’s Historic Corridors also contain offices and editing suites so creative teams can work together to develop scripts and produce projects of every description—including documentaries covering our humanitarian programs, an inside look at Scientology as a global movement and presentations on the life and legacy of Scientology Founder L. Ron Hubbard. includes facilities for music soundtracks and audio post-production. All three Music Scoring Rooms are equipped with the custom designed Clearsound audio systems to ensure the highest quality of sound. was built from the ground up under the careful guidance of a world-renowned acoustician. It is one of five surround sound mix rooms—each constructed to push the boundaries of audio excellence. In the studio’s central administration facility, the Church shapes its messages for broadcast and prepares them for distribution across television, radio, podcasts and all other media channels. The central point for the planning and execution of international media campaigns—public service announcements, television ads, magazines, brochures, Internet sites—and every other conceivable type of content. This is also where all informational films and videos are produced for the audiovisual Public Information Center displays located in every Ideal Church of Scientology. is the setting for presentations and working meetings with documentary television, advertising and media professionals, as well as like-minded groups and organizations. The Auditorium is equipped to handle video and audio presentations of the highest standards—a perfect venue to premiere our productions for officials, industry professionals and the press. , like all media departments on the lot, is networked into our proprietary translations database—the most advanced system of its kind in the world. This allows for instant multi-lingual uploads to the entire constellation of Scientology Internet sites and social media platforms. seeks solutions to society’s problems and uplifts human aspirations. Freedom now extends beyond print media to radio, television and online. of Scientology Churches, Missions and groups—along with Church-supported social betterment centers and humanitarian programs—it all comes together here. Coordinated production of news updates and international Scientology events brings our global accomplishments to Scientologists the world over. At the core of the digital media center is Central Ingest. This is where video footage from every city and town around the world is downloaded across ultra-high bandwidth and directly on satellite. All of it is indexed, catalogued and readied for broadcast. houses the most sophisticated high-performance media system in the world. Designed from the ground up, it is comprised of hundreds of advanced media processors all integrated into one “supercomputer.” It is networked to every other computer on the lot through more than 27 miles of fiber optic cable. The Scientology Radio Studio is built to transmit their message across a medium that reaches 95 percent of the world’s population. The studio brings a full broadcast lineup to the airwaves: News programs and radio talk shows of every description featuring Scientologists, like-minded organizations and interfaith groups. And all in addition to selections from beginning Dianetics and Scientology audiobooks as well as excerpts from selected L. Ron Hubbard lectures. Video and audio elements are assembled in broadcast editing suites to create television ads, PSAs, regular series and documentaries about every aspect of Scientology—from our Ideal Orgs and all they provide their communities, to the one-of-a-kind facilities built to forward the global movement. The Broadcast Building contains ten such editing suites. The combined speed and computing power of twenty visual effects stations provide the capability to produce computer generated images at a rate sufficient to meet the production demands of the global center. The broadcast studio for talk shows and news programs on what Scientologists are doing to help build a better world—from bringing spiritual and material relief in disaster zones, to advocating for human rights throughout the world, as well as fighting illiteracy and drug abuse. is for guests appearing on programs produced in the broadcast studio. Master Control is the broadcast hub for Scientology Media Productions. This is the final emanation point for the transmission of all programming for the new Scientology Television Channel. Church’s advanced, multi-platform, totally reinvented and restored motion picture and television studio launched May 28 in Hollywood delivering the message of help—unadulterated and pure—everywhere. One hundred fifty feet above Sunset Boulevard, at the center of a sprawling Hollywood, California, studio stands a communications tower emblazoned by a symbol: broadcasting waves flanking two triangles and a stylized “S”. The lofty logo boldly introducing itself to the entertainment-communications capital of the planet means only one thing. Mr. David Miscavige, Chairman of the Board Religious Technology Center, greeted the more than 10,000 Scientologists gathered to celebrate the opening of Scientology Media Productions—a new state-of-the-art digital media center delivering the message of help, unadulterated and pure, everywhere. Scientology Media Productions (SMP) is poised to broadcast important, good, vital news to the world. News reaching TV screens; facts and opinion destined to radios; magazines hot off of digital presses; information beamed to computers, tablets and cellphones. Yes, Scientology is in the news—that’s certainly proof that the religion is so interesting. But now Scientology Media Productions IS the media. On Saturday, May 28 an historic yet utterly high-tech media complex, SMP, opened. It’s a fully integrated digital media production center for TV, Internet and magazines, with a mission to harness the power of all media to bring real answers to the world. Scientology Media Productions will be the nerve center spreading the Church’s message to the world, and a resource to the ever-growing number of Scientology Churches, humanitarian endeavors and social betterment programs throughout the globe. Scientology Media Productions is a five-acre complex near the intersection of Sunset and Hollywood boulevards. Originally built in 1912, the studio includes state-of-the-art sound stages, creative suites, visual effects production areas, editing, audio recording and mixing, foreign language translation and dubbing—every aspect of broadcast and online production. Plus, the editorial headquarters of Freedom magazine, which produces hard-hitting human interest and investigative stories, are housed at SMP. Freedom itself is being expanded as a global news organization that encompasses print, television, radio and Internet platforms. It’s the most modern and sophisticated digital media facility of its kind on the planet. Scientology’s worldwide activities including humanitarian and social betterment campaigns, as well as news of current world events, are fed into Central Ingest, the studio’s international media clearinghouse, and accessible throughout the facility’s broadcasting, audio and publication operations. All of that is linked at its core by 27 miles of fiber optic cable connecting a cluster of super computers with a combined capacity of 3.2 million gigabytes of information and media platforms, distributed to proprietary databases for instant translation. When the Church acquired the studio from the public broadcasting station KCET, it committed to totally restoring the facility as a treasured piece of Hollywood history. From barrel-tiled roofs, to signature brickwork, to an historic Roman-Tuscan columned theater, to dressing rooms and more—all have been exquisitely renovated. Much of the history of the studio is displayed, echoing memories from movies that were filmed or produced there, including Kidnapped, 55 Days at Peking, El Cid, Love in the Afternoon, and Invasion of the Body Snatchers. The invitation in 1937 for L. Ron Hubbard to write scripts was dispatched from the facility’s address. LRH worked on films, including the highly successful 15-episode movie serial, The Secret of Treasure Island. An office at SMP, which includes the threshold LRH first crossed to start his cinematic work, contains an exhibition of his prodigious output during the Golden Ages of popular fiction and motion pictures. The grand opening of Scientology Media Productions comes at the nexus of the Church’s greatest wave of expansion in history, with Ideal Organizations shedding ribbons throughout the world. These Churches not only provide Scientologists with the ability to advance along their spiritual paths, but they are community headquarters that launch education programs to raise awareness of drugs, human rights violations, mental-health abuse, and crime. They also are bases from which Scientology Volunteer Ministers fan out to uplift entire areas with the religion’s technology, and bring succor to those that have faced catastrophes. Fifty Ideal Orgs are now complete, a dozen more are scheduled for opening this year and fifty more are on the runway. This past decade has further seen the Church embark upon major projects to spread Scientology’s message of help and hope. It first came with the establishment of Bridge Publications, the world’s largest all-digital, print-on-demand facilities to make LRH materials available anywhere, everywhere and in any language. Next came the creation of Scientology’s International Dissemination and Distribution Center in Los Angeles, the Church’s cutting edge, 185,000-square-foot, printing and distribution operation. And all in addition to the Church’s first class film studio at Golden Era Productions, where all LRH Scientology training films are produced. Finally, came Scientology Media Productions. At which point Mr. Miscavige cut the massive ribbon and opened Scientology Media Productions to the world.